I think I was 14 years old. I know I was in high school. My mother, in the depths of what I now know was depression, sat in the couch in our living room crying. This had become a more frequent occurrence in our normally bustling house. Like most 14-year-olds, I thought I had the solution. I tried to tell her that she had nothing to be sad about, that she should cheer up, that the lady down the street had it much worse than her — more kids, less money, more problems. Of course, that was probably the worst thing I could have said to her at the time, and she cried harder. She didn’t know what to do to make herself feel better, and at that point, neither did I.
I hugged her and she cried harder, saying that my hug almost made it worse, because when I hugged her, she didn’t feel anything. I come from a big, wonderful family — I am one of six children born to loving, hard working parents. Our house was always the center of activity on the block — filled with kids coming and going, a sink full of dishes, school projects or a Halloween costume in production on the kitchen table and a dog or cat or two somewhere needing attention. I couldn’t ask for a more supportive or nurturing childhood. On this afternoon, however, many of my siblings were away at school or living on their own. My dad wasn’t home, and I remember feeling very much on my own at that moment. I wanted desperately to help her, to fix the problem, but I was clearly without a clue. So I did the only thing I could do. I continued to hug her while she cried in the quiet living room that seemed so still and sad. The good news is that soon after that low, low point in our family, my mother went to a terrific psychiatrist and responded extremely well to the anti-depressants he prescribed for her. For many years afterwards we had our mom back, despite other medical challenges. I’m eternally grateful for the doctors and the medicine and the human ingenuity that made such advances in treatment possible. I witnessed a wonderful transformation. It wasn’t part of any plan, but it seems as this experience is now deeply connected to the work I do in documentary film. Movie making as therapy is an interesting idea — hopefully by experiencing other people’s struggles, audience members feel not so alone in their journeys. It’s not so much the sole agenda — good storytelling is the primary agenda — but it is a wonderful byproduct of sharing such intimate journeys. There’s also the educational value for others that have not experienced the trauma of mental illness. For me, it has been the education I’ve been looking for since I was 14 years old. The first professional step into this area was as a co-director of the film OC87: The Obsessive Compulsive, Major Depression, Bipolar, Asperger’s Movie. I was contacted out of the blue one day to meet with Bud Clayman, to help him and a mental health colleague Scott Johnston, create a film about Bud’s journey as a filmmaker who was sidelined by mental illness. My first meeting with Bud was an interesting one. I liked him immediately, but it was important to him to discuss “creative control” at this very first meeting. I remember thinking that was a “red flag” and that this might not work out. However, as the meeting progressed, in addition to documenting his journey with mental illness, he liked the idea of using film to recreate some of his more challenging lived experiences — riding the bus or elevator, walking down the street. This was a creative challenge that I could not resist, and thankfully, we continued the collaboration and made what I think is a wildly original, powerful film about Bud’s life. Soon after Bud asked me to work on OC87, he boldly stated that aside from his own personal transformation, he wanted “everyone who is part of this film to be changed” as a result of working on the project. I’m not sure if Bud experienced the complete transformation that he was initially seeking. I do know, however, that I was deeply affected by this journey. Bud and I are about the same age. We went to college at the same time. We wanted the same things from life — a healthy family life including the love and support of a caring partner, kids perhaps, and a satisfying career. Mental illness interrupted his filmmaking career just as mine was taking off. There’s a poetry in our working together. The element of change or chance is a big part of documentary filmmaking. You have to live with the idea that you can’t control all of the various elements that make up filming — health, weather, access, or what someone is going to say. You do your best to create the right conditions for what you hope will happen, and then roll with it. My on-the-job learning curve about Bud’s diagnoses has shown me that Asperger’s Syndrome and Obsessive Compulsive Disorder seem like a one-two punch that should thwart anyone diagnosed with these mental illnesses from their dreams of making a documentary. But Bud persevered. And I was inspired. Today he is faring well, and continues to inspire me. One particular moment early on in production impacted me, and made me realize that this was a special movie filming experience. We had been filming a scene on a public bus, which was designed to show how extremely challenging it is for Buddy to travel on public transportation because of the on-going monologue in his head. For this shoot we had rented a bus, filled it with extras and had a terrific time riding around the city, filming different angles and actors. Everyone was doing wonderful work, and Bud seemed to be having a great time. When we stopped to break for lunch at an area restaurant — which is usually a time when cast and crew can relax — I noticed that Buddy’s anxiety seemed to rise. He shared with me that he was having a very difficult time making “small talk” — something that comes easily for many of us – with the cast and crew around him at the table. He was seated in between two members of the production crew, and was conflicted about who he should talk to when. It created a lot of pressure for him, and I was struck by the fact that something as simple (to me) as breaking for lunch could be the source of anxiety and discomfort for my friend. How did making that film change me? I have a deeper understanding of and sensitivity to the perhaps hellish journeys that fellow travelers in life may be experiencing in the most common places such as buses, elevators and diners. I have a heightened sensitivity to people I pass on the street who might not be able to look me in the eye when I greet them. I don’t assume to understand how someone receives a message, until they tell me. I have a greater appreciation for my own ability to navigate different social situations. And, as Bud says in the film, I live with the risk. Working on the film reminded me of how delicate life is. Working on OC87 emboldened me to pursue another film project about the journeys of men and women suffering from mental illness. 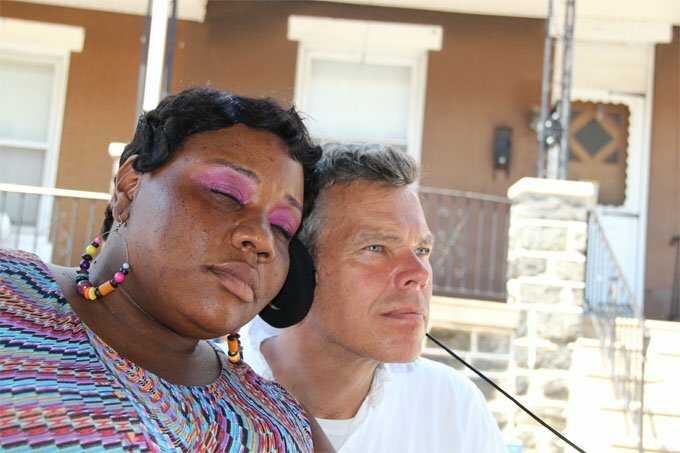 The Hollywood Beauty Salon is a tiny beauty parlor tucked inside the Germantown Recovery Community, a non-profit mental health facility in Northwest Philadelphia. The salon is not open to the public, but serves a small clientele in profound ways. Men and women undergoing treatment for mental illness gather here to have their hair done, share stories, and support each other as they rebuild their lives. In May of 2010 I entered the Hollywood Beauty Salon thinking that I was making a corporate video. I spent thirty minutes with “Hollywood” and “Butterfly” (Rachel and Sanetta) and I was tingling the entire time. I loved the intimacy of the place. Rachel’s eyelashes amazed me. More importantly, her words touched me. I was moved by their friendship, warmth and honesty and what I witnessed there on my first visit. So I went back again and again and again. 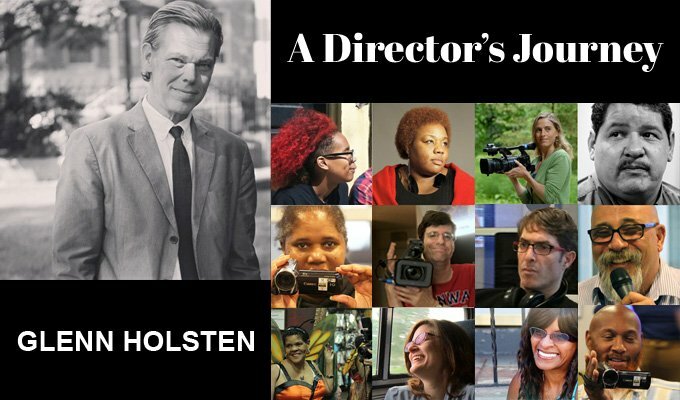 Every Tuesday, for about four years, I visited the Hollywood Beauty Salon to work with about a dozen members of The Germantown Recovery Community (part of NHS Human Services) to produce a full-length documentary film that weaves together powerful stories of transformation. 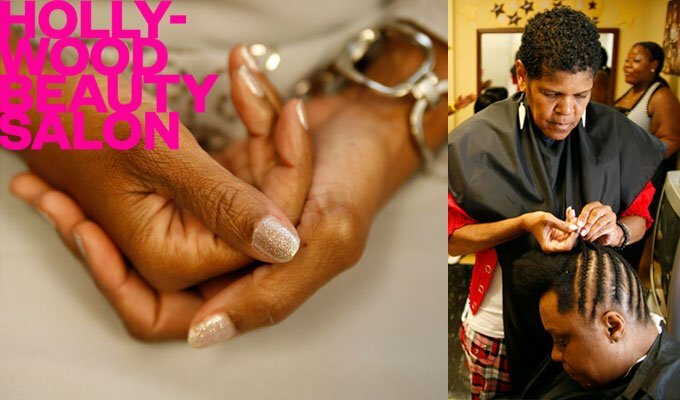 Hollywood Beauty Salon moves from struggle and darkness —including mental health challenges, addiction, trauma, and abuse—to hope and light, revealing the strength of this special community. I have worked with each person in the film to design the storytelling approach (animation, drama, documentary, etc.) of his/her section, a process that empowered the group to decide how their personal histories should be documented and shared. Everyone has also been part of the editing process. We’ve all been building on each other’s strengths, and have grown as a result. During this time, I have documented tiny recovery revolutions — small moments that seem like baby steps from afar, but are in fact bold moves in close up. I filmed as Mr. Kozempel, whose dreams of a career in music were thwarted by mental illness in his early 20s, picked up his flute almost 50 years later in hopes of once again pursuing a career in music. I also directed Darlene, in a dramatic sequence she wrote and designed, as she meets her young self — in effect facing head on the trauma of childhood abuse and neglect. And I filmed as Sanetta (aka Butterfly) flew in front a green screen in a television studio, breathless as she breathed life into her recovery metaphor — that of a butterfly emerging from a cocoon of illness. There are many lessons about life to be shared by people who have lived so much, but who have rarely been asked about their experiences. Even more rare is the opportunity to use a creative medium like film to explore their lived experience, and portray worlds real and imagined. After public screenings of the documentary OC87, audience members were charged by the film and would offer up their recovery journey stories. 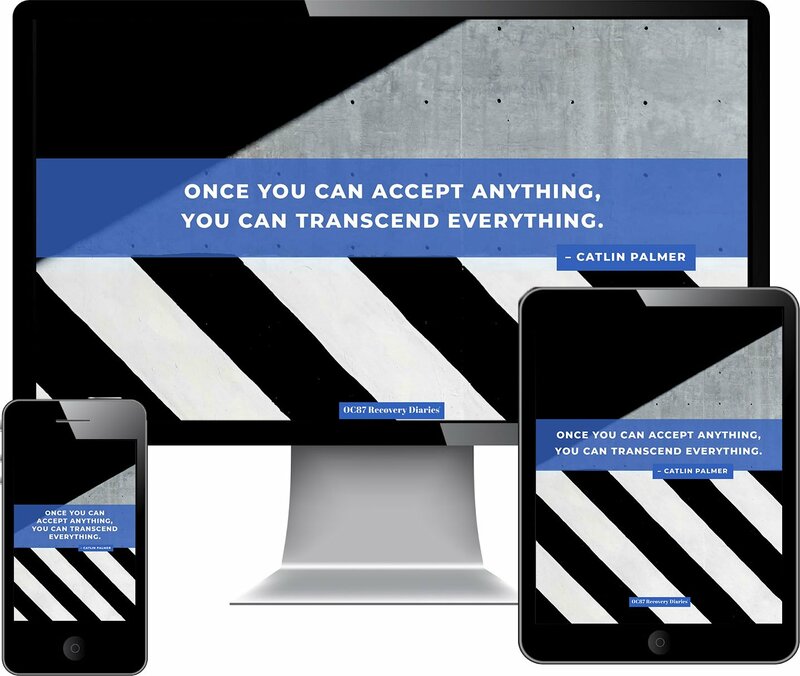 We decided to create a space for them to live — and this site was born. We like to tell stories that somehow position themselves at the intersection of mental health and creative storytelling. This site is a prismatic approach to mental illness. What’s exciting to me is that we’re kind of unlimited in the opportunities to explore experiences of those in the mental health arena — videos, essays, film and book reviews, personal narratives, photography, and poetry — it’s all about stories and experiences. We learn from each other. I feel so fortunate that I have an ongoing forum to continue this dialogue and, a bit selfishly, my education about mental health. I recently had an “Aha!” moment about my place in this world while filming an upcoming segment for this site. I was interested to learn that a team of mental health workers from Montgomery County Emergency Service, which is on the grounds of Norristown State Hospital, was presenting a production of Thornton Wilder’s play “Our Town.” The actors were nurses, therapists, and other hospital emergency personnel. The production was both a staff bonding experience and an effort to enhance their sensitivity to each other and improve their abilities to serve their clients in crisis, in a high-pressured work environment. One of the important messages of “Our Town” is to be present — to notice the lovely and honest details of everyday life, and to appreciate the power and beauty of these moments. As I was filming the rehearsal of a surprisingly touching performance by a cast of non-professional actors, I was struck by the power of what I was witnessing and by Wilder’s words. I realized that my career choice, to be a documentarian, is really about such moments — although in my case, I’m hopefully in the moment with a crew and a camera and a microphone. 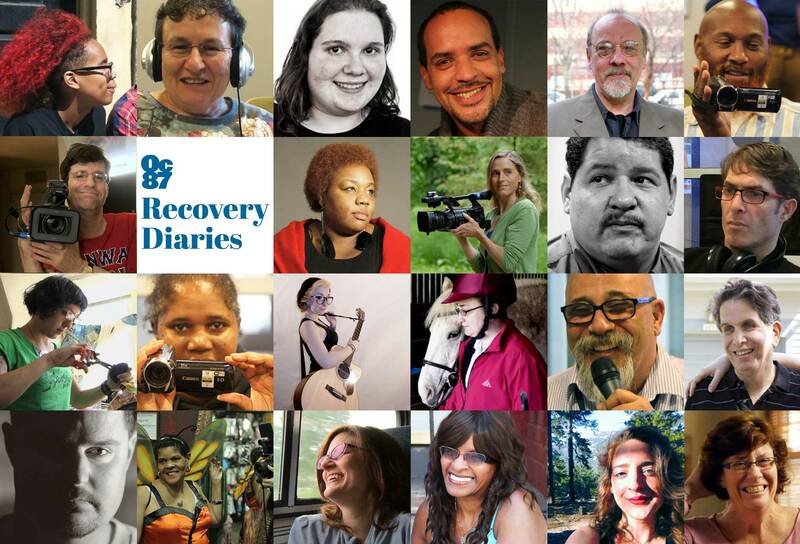 I am honored to be a carrier of these recovery stories, using film to capture and hold onto the fleeting moments of life, to celebrate the quiet yet powerful achievements of people in struggle, and to craft compelling stories to share those moments with others, so that they may live on to entertain and inspire. Not all moments are good ones. But they all have immense value. Like that quiet, sad, afternoon in the living room as I sat holding my mother while she was suffering from the depths of her depression. I know now that there were no words that I could have said that would have helped her at that moment — there is no quick fix. I know now that there is medication, there is therapy and there is a lot of hard work for anyone on a recovery journey. I am comforted, though, that I also know now that holding my mother and being by her side was the right and only thing a 14-year-old boy could do.